A hedge fund billionaire wants Rupert Murdoch to keep Comcast in the running for 21st Century Fox. Sir Christopher Hohn, whose funds control about 7% of Fox (FOXA) shares, disagrees with Murdoch's view that a Comcast (CMCSA) deal presents a higher regulatory risk than a deal with Disney (DIS). "We will be strongly motivated by the deal that offers the highest price and we will encourage other shareholders to do the same," Hohn wrote in a letter to Murdoch on Thursday. Fox declined to comment. The letter was first reported by the Financial Times. Comcast and Disney have been fighting for the right to buy most of Fox. The assets up for sale include Fox's movie studio, which has the "X-Men" and "Avatar" franchises, and the FX and National Geographic cable channels. Both Comcast and Disney see those media properties as an important way to stay competitive with Netflix (NFLX). Disney agreed to buy the assets last December. After Comcast tried to gatecrash the deal earlier this month, Disney sweetened its offer. Fox and Disney shareholders will vote July 27 on the proposed $71.3 billion deal. Federal antitrust officials said Wednesday that they would approve the purchase as long as Disney sells off 22 of Fox's regional sports networks. 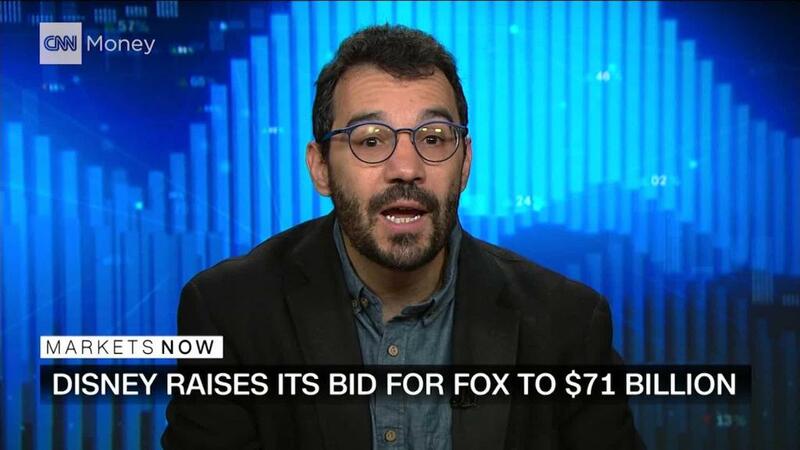 Comcast could still make another run for Fox. If it does, Hohn argued, Murdoch should consider it. His letter was prompted by a regulatory document that Disney and Fox filed earlier this week. The filing said that Fox's board believes the Comcast deal poses "relatively higher regulatory risk — in terms of both delay and closing risk." Those words acknowledge the head start that Disney got with its initial bid in December. Comcast's offer hasn't been vetted by the government. They also suggest that Fox is concerned about whether the Justice Department would sue over a deal with Comcast, as it did when AT&T (T) reached one to buy Time Warner. Like Comcast, AT&T is a content distributor that wanted to buy a content creator. Antitrust regulators said the AT&T deal would harm competition and raise prices for consumers. A federal judge ultimately sided with AT&T, which is the parent company of CNN. But in the filing, the Fox board cited the Justice Department's "apparent sensitivity to the potential anticompetitive effects of vertical integration." And U.S. District Judge Richard Leon, who decided the AT&T case, warned in his ruling that the AT&T case does not set a precedent for other similar mergers. In Thursday's letter, Hohn dismissed the antitrust concerns in a potential Fox-Comcast combination. He wrote that the AT&T decision "is unequivocally positive for issues of vertical integration of content with a pay-TV platform." Hohn suggested that Comcast's content business, NBCUniversal, shouldn't pose problems. The Justice Department's decision to give the green light to Disney-Fox "sets a strong precedent and a template for a Comcast settlement," he wrote.